On the Royal Albert Dock project for Multiplex, we have introduced the one step hop-up platform with guardrail. We brought the use of these onto our project as general hop-ups with no guardrail do not comply with the working at height regulations, yet many operatives were not aware this. We found that many operatives believed the distance of falling from hop-ups with no guardrail was not substantial enough to cause serious harm so they never purchased one. We did re-evaluate working at height with all operatives and included the risk of falling from hop-ups with no guardrail and this gave all a new perspective on working at height. All contractors now use the one step hop-up platform with guardrail as it has a locking guardrail gate and offers full protection on all four sides. 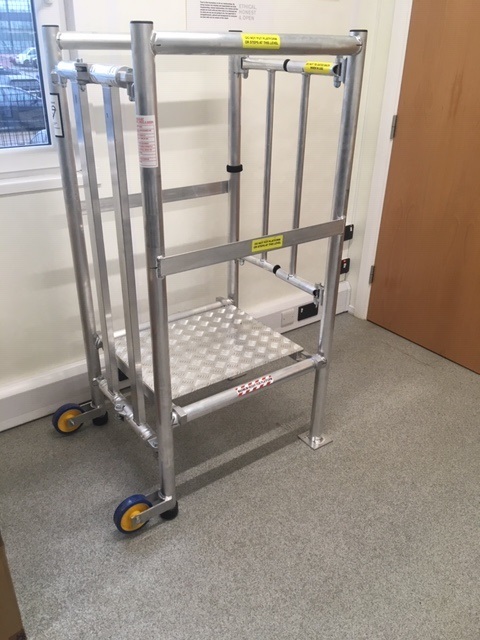 The one step gives a reach of 2.4 meters and is easy to carry and can fit in tighter areas which meets all the contractors requirements and keeps them more protected.